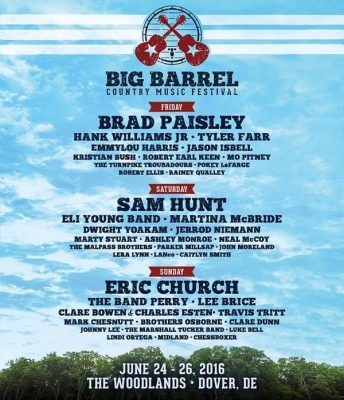 DOVER, DE (Oct. 26) - The second annual Big Barrel Country Music Festival will take place June 24-26, 2016 at The Woodlands of Dover International Speedway. The festival will feature headliners Eric Church, Brad Paisley, and Sam Hunt as well as Hank Williams, Jr., Tyler Farr, Eli Young Band, Martina McBride, The Band Perry, Lee Brice, and many more. Returning in 2016 are fan-favorite attractions including Harvest Moon Dance Hall, The BBQ Pit, and The Big Barrel Market. The family-friendly area, The Patch, will also return complete with The Stable, Big Barrel's on-site petting zoo. Tickets go on sale on Friday, October 30 at 10am EST through BigBarrel.com. Three-day general admission passes start at $149 and kids eight and under are free. Camping packages go on sale at that time. Guests can choose from RV packages, tent camping or The Corral Club, which includes a private air-conditioned tent. Payment plans are available. Complete festival information can be found at BigBarrel.com.